Ruling that the USPTO failed to meet its burden to provide clear evidence that THUMBDRIVE is generic, the Board reversed a refusal to register the mark for portable digital electronic storage devices. The record included "both trademark and generic uses [and] evidence of lack of competitor use," which at a minimum created "doubt sufficient to tip the balance in favor of registration." In re Trek 2000 International Ltd., 97 USPQ2d 1106 (TTAB 2010) [precedential]. The Board first addressed a procedural point concerning Trek's argument that the case had been improperly restored to the Examining Attorney after publication because no showing of "clear error" was made with regard to the approval for publication. It pointed out that "questions involving applicability of the 'clear error' standard are the subject matter of a petition to the Director, and are not proper for consideration by way of an appeal to the Board." The Board's jurisdiction is limited to the correctness of the substantive refusal, and does not encompass procedural issues arising out of prosecution practice. Turning to the substantive issue, the Board stepped back to view the policy behind the genericness refusal: to prevent harm resulting from monopolization of a term that should be available to competitors. On the other hand, a finding of genericness is a "fateful step" that pitches the term into the public domain, a step not be taken "until the trademark has gone so far toward becoming the exclusive descriptor of the product that sellers of competing brands cannot compete effectively without using the name to designate the product they are selling." The Examining Attorney relied on various Internet excerpts showing use of the term "thumb drive" generically for portable data storage devices. Applicant Trek pointed to its ownership of a Supplemental Registration for THUMBDRIVE for various computer-related goods, including apparatus for storing data. It urged that the Examining Attorney had not met her evidentiary burden because the record raised doubt about whether the mark is generic. Trek's evidence showed that it coined the term in 2000, that its sales exceeded $4 million from 2002-2007, and that it advertises and promotes the mark and authorizes others to co-brand and sell USB storage devices bearing the mark. It also submitted Internet pages showing media usage of THUMBDRIVE as a brand name, a Wikipedia entry referring to the term as a trademark, and negative dictionary evidence. And finally, Trek provided evidence of its policing of the mark. The Board particularly noted the absence of generic use of the terms THUMBDRIVE or THUMB DRIVE by competitors, during ten years of use of THUMBDRIVE by Applicant. Instead, competitors use "flash drive" as the name of the goods. "In other words, the evidence does not 'demonstrate a competitive need for others to use' this term." The Board found this case to be similar to America Online in its "mixed record on the question of genericness." Such a mixed record creates a doubt that must be resolved in favor of the applicant. Noting that its genericness determination is an "all or nothing" decision and that the evidentiary burden is "heavy indeed," the Board refused to take the "fateful step" of full "eradication" of Trek's rights. While evidence of competitor use is not required to satisfy this burden, where the record demonstrates both trademark and generic uses, evidence of the lack of competitor use, at a minimum, may create doubt sufficient to tip the balance in favor of registration. Finally the Board distinguished this case from those in which a term was in the public domain at the time of adoption (e.g., POCKET BOOK) or those where the term is simply a combination of generic terms (e.g., SCREENWIPE). TTABlog comments: Note that the outcome on the genericness issue might be different in an inter partes context, where an adversary might offer survey evidence, or in an infringement context, where the genericness question may not be an "all of nothing" proposition. There's a lesson here for trademark owners trying to fend off a potential claim of genericness: actively police your mark, hound the media about using the mark correctly, and insist that dictionaries recognize the mark as a trademark. Also Wikipedia is available for posting a favorable entry regarding the mark. A trademark owner, particularly in the case of a very strong and unique mark, will never be able to stop all improper usage by the ordinary consumer (e.g., on Twitter, eBay, and the like). Nonetheless a reasonable policing effort is the price of creating and maintaining a great trademark. Today, with a 24-hour news cycle and 24/7 online global activity, undoubtedly many trademarks are misused repeatedly, perhaps, in part, because there is less time for editing and reflection before news reports or blog posts are released, and, in part, because what was the casual spoken word between people is now the written word posted to the world. I love it when you say "survey." But more to the point, I was surprised when I saw the headline as I had always (?) used Thumbdrive as a descriptive term. Your article nicely traced the Board's decision. I'm guessing this is not the last we will hear on this. That's crazy there wasn't enough evidence of genericness. The Examining Attorney's appeal brief has about 50 citations showing generic use - how much evidence does one need? This decision baffles me, particularly in light of their NANDRIVE decision. 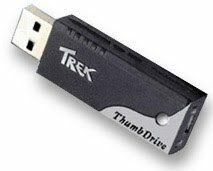 I've never heard of THUMBDRIVE as anything but a descriptive or generic term equivalent to flashdrive. If it truly is a brand name, Trek had better go "XEROX" on this and educate the public and media.